Donseed’s recent industry-leading software development has led to the launch of Donseed Workplace, an enhanced Biometric Identity Workplace Management solution. Donseed Workplace® captures a workforce’s data using biometric identification at the point of entry and exit from a construction site. It integrates biometric hardware with intuitive software, giving construction companies accurate visibility of its whole workforce across numerous sites and projects. Dave Ingram, Chief Operating Officer at Donseed, talked of his excitement at the launch of Donseed Workplace®. “The new solution is designed to drastically improve efficiencies and remove the pressures from both site-based and office-based staff who are responsible for the process of collating timesheet information, authorising payroll, maintaining health and safety compliance and looking after operative’s training and qualifications,” he said. Donseed Workplace® uses industry-leading biometric hardware best suited to the temporary and mobile nature of a construction site and perfect for transient workforces. There are a variety of hardware options available, from a portable biometric tablet to a cost-effective mobile app and integrated access control. The data captured on site is easily accessible on any device with internet access through the Donseed Workplace® Customer Portal in the cloud. It can be quickly exported, and both automated email alerts and bespoke reports can be configured. Since 2007, Donseed has become a leading name in supplying Biometric Identity Workplace Management solutions to the construction industry. Currently, Donseed is in use at more than 800 temporary, mobile and permanent workplaces, being used by Main Contractors, Specialist Sub-Contractors and Clients. 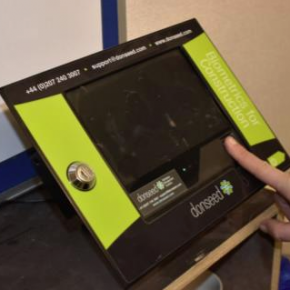 If paper records are still your method of choice for managing individuals entering your sites or you are not completely happy with your current biometric solution and want a change, you can arrange a demonstration or request pricing from Donseed by clicking here or calling 0207 240 3007. Donseed will be running free online webinars throughout May and June to show how Donseed Workplace® works. Dates and free registration details can be found here.